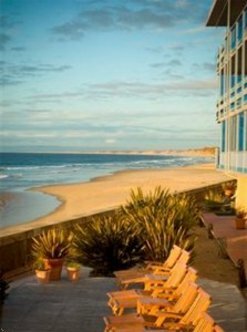 Best Western Beach Resort Monterey offers oceanfront views and direct access to the beach. This luxurious hotel offers 196 rooms and is the only hotel located directly on Del Monte Beach Select a room with expansive views of Monterey Bay or a quiet non-ocean side room overlooking colorful courtyards. We provide business/meeting services and banquet facilities for groups up to 700 guests. Explore miles of unspoiled beachfront and return for a healthy workout in our brand new exercise facility Enjoy such world famous attractions as Cannery Row, Pebble Beach and 17 Mile Drive, the Monterey Bay Aquarium, Point Lobos and Big Sur all are just minutes away from your door The beach, the view, the attractions make this the perfect vacation resort. $10.00 parking fee per day plus additional county tax of $1.00 per day and $7.75 sur charge per day added to each room.